Deputy Westwood was shot to death during the escape of two prisoners from the Grand County Jail. The 65-year-old victim and another officer arrested two men for possession of stolen property. The suspects were placed in the unstaffed jail. Several hours later, Deputy Westwood returned to the jail alone. He was shot with a .32-caliber pistol the men had managed to conceal from the officers. The two suspects escaped but were recaptured, tried, and convicted. One of the men died in prison in 1963. The other was paroled. 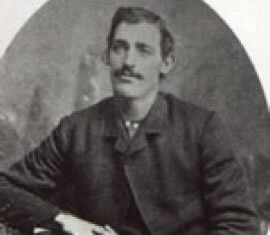 Deputy Westwood was married, the father of 12 children, and is buried in Grand Valley Cemetery, Moab. His bronze name plaque is sponsored by Alan and Jean Hall. Gone but not forgotten, a family hero. The Utah Peace Officer Association is going to be honoring Deputy Richard Westwood at the Fallen Officer Trail Ride in Moab on April 18 2015. We would like to invite Family and friends to come to the event to help Honor Deputy Westwood and all our Fallen Officers.